On 29th September 2017, an overcrowded foot over bridge at Elphinstone railway station, Mumbai witnessed a horrific stampede. 23 people died. What can we, as a society of organizations, do in the aftermath of the Elphinstone stampede? 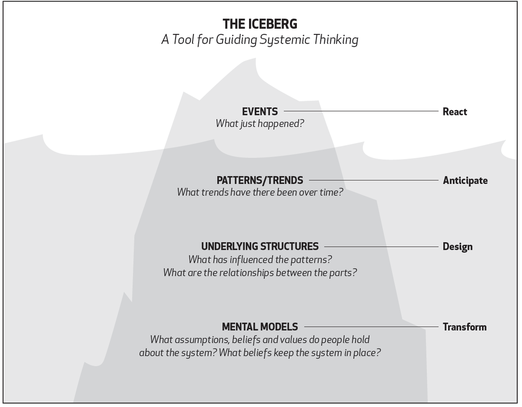 Let us explore the way forward using systems thinking. It might be a good idea to start with a description of the mental model we carry in our collective consciousness. Mental models are the very foundation, the source of how we create our own social reality. Here is an articulation of the current mental models as I perceive them. Now, onto the set of beliefs that power this mental model. Putting forward just three beliefs. Mumbai is the only place there is. There is no alternative to travel for work. There is nothing we can change about our work-conditions & overall environment. The famed ‘Mumbai spirit’, the one we use to limp back to work the very next day after any calamity, is a popular expression of this mental model. History & Geography have influenced the underlying structures the most. Historically, the British started setting up offices in what is called town and everything spiralled northwards from there. The insular nature of the city meant limited options of spreading. Office locations clustered around the south and center in the main. Most working people travel from everywhere north ( cheaper residential rates) to the center or south. For the railways, this meant rush-hour madness and chaos involving 6 million plus people travelling south in the morning & north in the evening. As Peter Drucker said, success obsoletes the very behaviours it is based on. Railway access enabled residential development northwards that in turn, increased the load of work-bound commuter traffic southwards. Of course, now, Mumbai’s overall population is so big that no place or direction can be said to be free from any traffic congestion – be it rail or road. Administrative control of Railways has been in Delhi. That has impeded easier cordination with other city stakeholder institutions like the BMC and the Mumbai police. No one is subordinated to the other; but that has also meant a horribly uncoordinated response to the evolutionary growth of the city. Mumbai suburban is the lifeline of the city. It is a lifeline that itself is being strangulated by lack of space & a breaking load. Financial capital means a big source of revenue for the local government. It wants Mumbai to continue to host business establishments and trade houses. History favours the law of inertia. Everyone sets up shop here. Offices keep expanding, people continue to be needed and there is an army of workers of every hue available to play the part. Places keep getting congested. Every office location becomes a victim of it’s own success and things turn from bad to worse in terms of the daily commute. Railways has increased rakes and tracks but they will always fall short because of the mammoth numbers that keep on growing. The definitive trend is that of railways simply unable to cope with the numbers and the entire suburban system collapsing under its own weight. We all know the event. 23 people died because of a stampede on a railway foot over bridge during office hours. What caused this particular event is less important for the purpose of this article. What matters more is to note that everything that is required to make this a tragic pattern exists. The rush-hour traffic, the numbers, the structural constraints, the woeful infrastructure. The all important question is, How can things change? We have to work on the mental models. Mental models & physical reality go together. It is not that only the physical reality creates mental models. Mental models also create physical reality. Here is a powerful example of a mental model. Decision-makers across need to revisit the mental models of Mumbai. Let us revisit the three beliefs. No it is not. And that is the only thing that can save Mumbai. It is time to de-glam Mumbai. And to have other places come up; to invest more in getting them upto speed. This is applicable for all decision-makers – from governments to corporate companies to small scale enterprises. Of course, the government takes the lead in creating a viable eco-system for this to happen. But many a time, enterprising companies set up shop in the tier-2 or tier 3 cities and succeed. They are true pioneers! Why so? Can we all learn to communicate and work as well in a virtual community? If the circumstances force us to, say there is a curfew or a bacterial virus outbreak, anything that creates a lock-down scenario; organizations will innovate to continue critical work – won’t they? Why not force themselves, right now? Learning to operate like a virtual organization even when you don’t need to right now, is a great source of competitive advantage – only if corporates realise that. Even if organisations need to get people together, they can always become flexible on two points – where do we meet? What times do we meet? Just because of rigid mindsets, three people might fail to realize that they are commuting to their Churchgate office for a meeting involving just the three of them ; this, when they stay at Kurla, Powai, Mulund ( All nearer to each other than Churchgate ) If asked why, the reason given would be a variation of the office being a sacrosanct place where it is proper. Or saving costs – who pays? Sadly, employers don’t grasp the net gain of productivity and vitality of spirit because of commuting stress having been taken out of the equation. It’s worth paying for. It makes for better business outcomes. We must aggressively explore tele-commuting and work from home options, not just as a business imperation, but as a overwhelming social need. I have no idea whether business establishments setting up shop in and around Mumbai’s erstwhile mill areas made a representation to the government to expand transport infrastructure & improve connectivity. My point is they would lobby very hard on matters of corporate tax & such regulation; but would they be as aggressive and persistent in improving the commuting of their so-called greatest assets? That doesn’t seem so. There is so much scope for collaboration among business establishments in specific locations. They can co-ordinate office timings, create transport-sharing hubs, issue commuting advisory, even share non-core services wherever possible; all in the service of just one goal – making their employees commute as comfortably as possible. How many PR or corporate communications professionals nudge their employers and say, ” Can we not leverage our skills and media networks to engage public and regulatory authorities and improve the lot of our commuting employees?” If all of the above is not happening, it is because of the mental model not being there. And everything that they would do here is core to their effectiveness as an organisation! I am not suggesting any philanthropic or charity work. This is something they do for their own sustained success. Our current mental models began as adjustments to Mumbai’s growth as a booming city and are now maladjustments, which contribute to a sick society that cannot revive without basic physical and social infrastucture. When we change our mental models even to a small degree, we create opportunities – to reshape underlying structures of our civic bodies, to renegotiate the patterns of choices, of actions, of interactions and to actualise positive events/prevent unwelcome ones. Consider the cascading effects if people work from home ( real estate prices, car purchases, laptop sales), not to mention the breathing space it would offer to the Mumbai suburban networks. We might just be able to make a local commute non life-threatening. And that is no mean feat. The suburban network will get more flexibility in collaborating with other rapid transit systems. Simply because it would then have begun to hold its head easily above water. The more we can do to free up commuting space, the safer people with no choices but to travel – including blue-collar workers – will be. A significant step towards healing an increasingly sick society. Thank you, Neha! Good to know that..
Well thought out and written, Rahul. There are several issues affecting citizens – not just in Mumbai, but across India – where a systemic approach would pay rich dividends. Unfortunately, what people want is ‘instant’ results, which a systems approach does not provide! True, Sunder. We have grown up uneducated and unaware of how things truly work the systems way. That is the biggest stumbling block.